Keeping your AC unit small can pay off. Get better performance and save on energy bills with these brands. This 55 lb. portable air conditioner offers 12000 BTU of comfort and is excellent for cooling spaces up to 400 sq.ft. This 43 lb. portable air conditioner offers 8000 BTU of comfort and is excellent for cooling spaces up to 350 sq.ft. This 95 lb. portable air conditioner offers 13,500 BTU of comfort and is excellent for cooling spaces up to 700 sq.ft. Portable air conditioner units are popular during heatwaves and sweltering summers, but bigger isn’t always better. Although 75 percent of the US has central air conditioning, there are millions of homes in mild or cold climates that don’t have central ACs because there’s simply not enough use for them. For these homes, portable air conditioners are a good way to deal with short-term heat waves or a few sweltering weeks in summer. They’re not the most efficient air conditioning system available (compared to window units) but they do offer comfort and cooling that’s better than basic ventilation from a fan. They’re less expensive to operate compared to central air conditioning, and because they can move from room to room, there’s flexibility and convenience to change with the seasons. If a regular energy efficient window AC won’t work in your home, a portable air conditioner can cool down a room relatively well, depending on factors like climate, direct sunlight, humidity and room ventilation. The average portable air conditioner clocks in at about 50 to 80 pounds, and though they’re marketed as “portable,” this is hardly a defining feature of the appliance. They can move from room to room, yes, but the setup of a portable AC makes it difficult to do so with any ease. The weight of the unit, combined with the setup time and effort, mean that most portable ACs simply stay in one place as needed. So why does getting the smallest unit matter? Aside from taking up floor space, smaller units can be more efficient at cooling down a room. A less is more approach is best here: it’s often ideal to get the smallest portable AC that will still comfortably cool your room without expending unnecessary energy. That said, the size of your unit will also depend on the size of the room, so that some of the smaller units may not have the cooling power for a larger space like a living room or large office. If your home is limited on space, or the areas you need to cool aren’t large, a small portable AC unit can do a good job of cooling the air while still keeping your energy bills down. 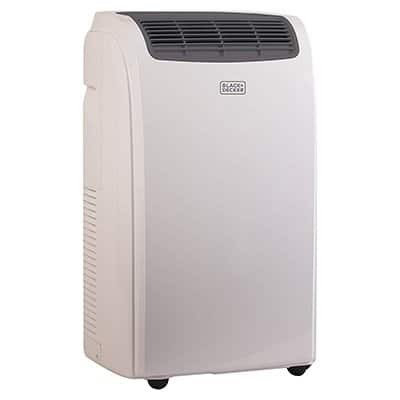 Our research found that the best small portable air conditioner depends on which room size you are aiming to cool. For smaller areas, a compact or mini AC that emits 8000 BTU will get the job done and we recommend the Honeywell MO08CESWK because of its build quality and reliability. For mid-sized rooms, we chose the Haier HPC12XCR, based on the unit’s height, weight, and overall user experience. This model offers a cooling power of 12,000 BTU, enough to cool down about 450 square feet. If you have a room larger than this, you’ll want to consider something in the 14,000 BTU range, but those are bulkier units. The Friedrich ZoneAire is best of this category as it combines performance with smart, streamlined design and is capable of providing relief to up to 700 sq. ft.
To find the best small AC units, we spent hours analyzing dimensions and data from more than 50 models. Our final list of 30 models was based on user feedback, expert reviews, manufacturer data and the features of each model, as well as government energy reports and ratings. From there we examined the list further to come up with the best 9 brands. Our research showed that the average height of our models was 29.9 inches, and the average weight was 67.8 pounds. There were 23 models under that height and 17 models under the average weight, and we weighed (excuse the pun) those factors alongside cooling performance and customer reviews. Ultimately, there were five models that had low weights, low heights, and relatively good user experiences. In addition to our top two picks from Haier and Honeywell, there are several other choices for various categories. Because the difference in height, dimensions, and weight was often minimal between units, we also recommend several ACs based on their features. The smallest 10,000 BTU unit we recommend is the LG LP1017WSR. It’s just slightly shorter than the Haier model, but it does weigh an additional five pounds. This model would be ideal for smaller rooms, nurseries or offices that don’t need a lot of power but want to minimize the space taken up by an air conditioner. The LG model is best for rooms up to 300 square feet. If you’re looking for the smallest 14,000 BTU unit, we recommend the Honeywell MM14CCS, which is the lowest and lightest of the 14k BTU units we researched. If you’re only looking for a dual hose portable AC, we recommend going with the Whynter ARC-122DHP because of its relative size and performance. Though it’s a few inches taller than most of our picks and slightly heavier, it is a great option for those looking for performance over just size. Its dual hose setup means more energy is spent on cooling the air rather than circulating air that’s been warmed by the compressor, an inefficiency that’s worth noting for single hose units. Cooling Area 250-450 sq. Ft.
We recommend the Honeywell MO08CESWK as our top pick because of its light and compact size, as well as its performance and features. This is an outstanding and reliable portable AC. Although it’s one the shortest of all the BTU air conditioners we’ve reviewed, it still offers solid performance and plenty of positive user reviews. 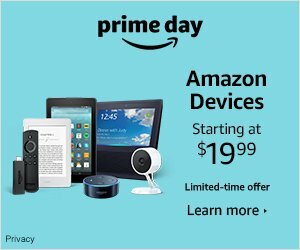 This model is one of the better-rated units on Amazon, with Honeywell’s website also filled with rave reviews about the product. Most manufacturers’ websites will have better, more positive ratings than third-party marketplaces so always be careful when considering these. Weighing around 43 pounds, or slightly more with hose and wheels attached, the MO08CESWK is incredibly easy to move around your home. It is the lightest AC on our list and easily the most maneuverable. If your focus is more towards cooling power than mobility then you are also in luck! This unit is an excellent performer, especially for an 8,000 BTU-unit. The MO08CESWK comes with portable AC standard features like a remote, LCD, 24-hour timer, dehumidification abilities, and multiple cooling speeds. While it doesn’t offer anything too unique, it offers efficient cooling with a quiet output and is manufactured by one of the worlds leading air conditioner brands. Honeywell says this unit cools rooms of up to 450 square feet, but again this is dependent on external factors. In our experience – up to 350 sq. ft. is the right sized area for this unit. Like all the units we recommend, it has an auto-evaporating system that doesn’t require draining, but if used solely for dehumidification, it requires you to hook up a standard garden hose. The MO08CESWK dehumidifies 61 pints in a 24-hour day, but this feature of room air conditioners should be less of a consideration than overall cooling performance, as humidity will be removed from the air no matter what. The window installation for this unit is made easy thanks to Honeywell’s vent kit. Although it’s nothing to write home about, it gets the job done as long as you follow the instructions. In this youtube review – you can see that set up is easy and getting started will not take you a long time. Settings on this unit can range from 61 to 89 degrees-Fahrenheit, so you have a good range of temperatures to choose from. The noise produced by this unit isn’t much louder than that of our other recommended units (50–53 dBA). The Honeywell MO08CESWK comes with a 5-year limited warranty: one year to cover parts and labor, and 5 years for all parts of the sealed system, including the compressor. At 1,200 watts, the energy use is about on par with the LG 10,000 BTU unit. Overall, it’s a great option if you’re looking for the quality cooling power in an 8,000 BTU unit. The small size, wheels and lighter weight all contribute to this being our favorite mini model. Cooling Area 100-150 sq. ft.
Black & Decker’s BPACT08WT portable air conditioner is ideal for consumers’ convenience once the heat kicks in during summers. Designed to cover an area of between 100 to 150 square feet, this ultra-compact AC is essentially suited to double-hung or sliding windows. Offering 8,000 BTUs, this portable air conditioner ensures a steady and powerful airflow that aids in maintaining a consistent temperature in any room. The portable AC is fitted with four caster wheels for ease of mobility, with a 5-foot long exhaust pipe. Set with a LED display, Black & Decker offers increased electronic control for efficient energy consumption. Its 3-in-1 feature option includes combining the AC’s cooling fan and dehumidification operation with its noiseless functioning, making the BPACT08WT perfect for cooling. During its functioning, the AC uses 115 volts, 950 watts, and 60 Hz; the window kit comes with a remote control to provide users with the luxury of adjusting the temperature without having to get up. As the smallest of our picks in terms of depth, the box-shaped BLACK&DECKER BPACT08WT is most suited for storage and mobility in small spaces. 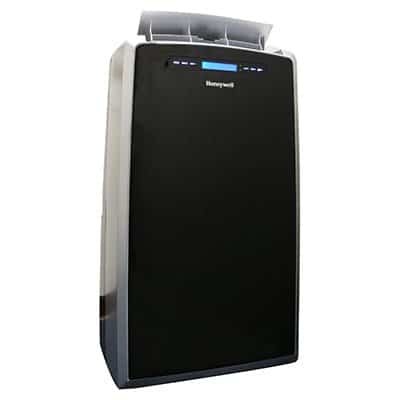 The BPACT08WT poses as the appropriate choice if you live in an apartment with limited storage space, and require cooling for small-sized rooms. However, it is important to note that the unit’s cooling ability and noise levels are subjective to the climate of your country and its level of urbanization. It is one of the noisier AC units on our list but if you live in cities like NYC – this is less of an issue. 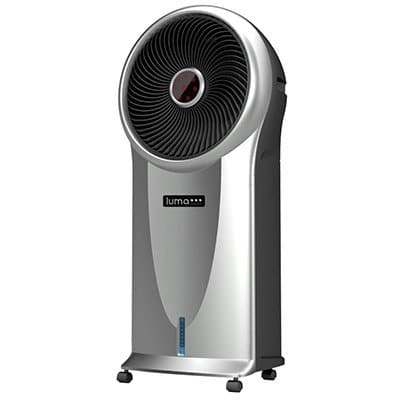 This Black & Decker model is competitively priced when compared to all the AC’s on our list, making it a solid choice if you are looking for a mini, value for money buy. Cooling Area Up to 250 sq. ft. Edge Star claims its AP8000W to be one of the easiest and smallest air conditioners in the world. 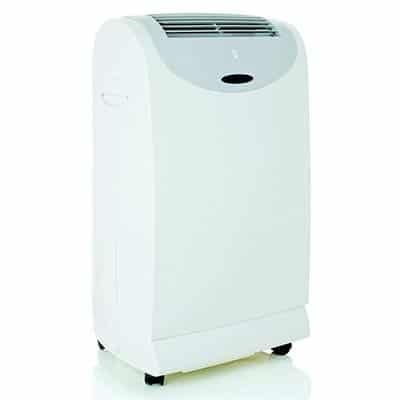 It can provide cool and refreshing air for up to 250 sq. ft. while channeling 8,000 BTUs. Standing at just under 25 inches tall, this is comfortably the shortest portable AC unit on our list and indeed in the world. With a 24-hour programmable timer, the AP8000W provides precise timings with the flexibility of daily programming, and its design incorporates a three-speed fan featuring directional air discharge louvers. This mini AC comes with a remote control, a window kit, filters, and casters to ensure the continued provision of cool air across multiple rooms. Its dehumidifier can absorb up to 50 pints of moisture per day with the help of its adjustable digital thermostat control. 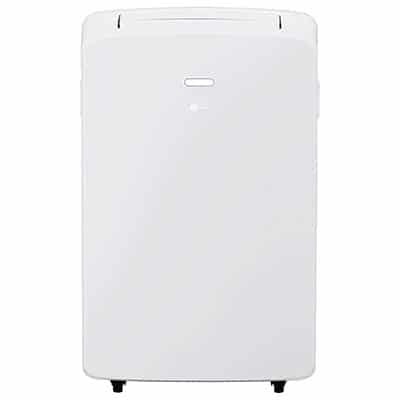 Edge Star has made sure that starting this portable air conditioner’s is a simple three-step process. The first step in the process consists of simply connecting the vent hose to the back of the unit. You must then remove the cap from the window vent kit and lastly, connect it to the exhaust hose. This portable air conditioner offers a cost-effective solution to cool any room. The mechanism for this 8000 BTU portable air conditioner entails running your unit 365 days a year without having to worry about draining the reservoir; it uses a CFC-free refrigerant making this unit ozone- and climate-friendly product. If placed in the middle of the room, make sure to contain the exhaust pipe’s end in a bucket for the condensate that will drain from the unit; preventing overflow shutdowns. The biggest advantage provided by Edge Star’s AP8000W is its size efficiency that allows for convenient storage and setup, unlike window ACs where owners need to comply with building codes or install brackets on the outside of their home or condo. The only potential issue with this portable unit is that it may tend to cool less when functioning in harsher climates as more powerful systems are generally needed. Still, if space is at a premium in your home then this compact EdgeStar model is certainly worth considering. For consumers looking to cool smaller rooms, or rooms that are naturally shadier or receive minimal direct sunlight (remember: sunlight and lack of shade can increase room temps by 20 percent or more), we’ve also recommended a 10,200 BTU unit – the LP 1017WSR. Like the Haier model (next on our list), the LP1017WSR has sleek, modern aesthetics that makes the unit less of an eyesore than larger units, and its performance often appears to match that of bulkier models. At 27.36” high, the LP1017WSR is shorter than the Haier model but does weigh a few extra pounds. For those looking to keep the height to a minimum, this is an excellent solution. The LP1017WSR comes with standard AC features: 24-hour on/off controls, an LCD remote, auto-restart and an auto-swing ventilation system that reduces hot spots. An auto-evaporating setup allows the unit to run all day without being maintained or drained, and the oscillating air design dehumidifies 2.5 pints per hour. According to LG, the LP1017WSR cools rooms up to 300 square feet, but this may change based on the environmental factors you’re working with. One reviewer on LG’s website said that they used the unit for emergency situations that called for immediate cooling. We bought this product when our central air went down during the hottest time of year. The ac unit was easy to install and worked well making our sleeping space livable. It was also a lifesaver during power outages during the hurricane. This unit is slightly louder than the Haier – at 53 dBA – but is still quiet enough that many users say it blends into the white noise of your home’s background. The unit has (at the time of this review) a 4.4 rating on LG’s website. Most users claim the benefits of the unit are its ease of use, performance, and clean styling and design. Two cooling speeds give you some flexibility and thermostat control makes it easy to keep the room at a level you’re comfortable with. A washable air filter is easy to maintain throughout the year, and because of its size and energy use (1,270 watts), you’ll be able to keep your utility costs lower than you would with a larger 14,000 BTU unit. An included window installation kit is par for the course when it comes to room air conditioners, and you’d be smart to seal up the window after installation. LG offers strong customer service and support, a good reputation for clean-styled products and one-year parts and labor warranty on the LP1017WSR. Cooling Area Up to 450 sq.ft. Clocking in at 56 pounds and just under 28” tall, the Haier HPC12XCR is our recommended small room air conditioner because of its combination of size and performance. Its 12,000 BTU cooling power is rated to cool a room up to 450 square feet, though many customers report using the HPC12XCR in a smaller room, such as a home office, and seeing good results. The HPC12XCR is as convenient as any of today’s technology-driven units: it has a full-function remote, digital settings panel and three cooling speeds that help circulate and cool air. Its sleek design and minimalist aesthetics make it a good choice for homes that want to keep things simple, and it’s low-key enough to stand in the corner of a room without becoming an eyesore. Its 12,000 BTUs is powerful enough to consistently cool the air, and even with the possibility of reduced real-world BTUs, many users find the cooling effects sufficient. A 6-foot power cord and 5-foot single exhaust hose offer an average amount of flexibility in where to keep your unit, and the included quick-install window kit is easy to use, most users note. We do recommend using tape or some sort of sealer to keep the window kit perfectly sealed, but we make this suggestion across the board – not just with this model. The top-air discharge setup is standard, and the digital panel is also on top of the unit; most users don’t mind this, but some pointed out that you can’t see the current settings from across the room, though the remote still work from that distance. The energy efficiency of this unit is solid: its small size and good performance make it more effective than many larger units. Grant Morgan at Top Ten Reviews. This Haier has an EER of 9.5, which is a bit higher than the lowest of 8.9. Per our calculations, this unit costs approximately $90.72 a year to operate. This calculation is based on eight hours of use daily for three months out of the year. Helpful features like auto-start and a 24-hour timer make it easy to “set it and forget it” when it comes to your preferences, and a self-evaporative draining system means you don’t have to empty out a bucket of water every day. Casters make the unit mobile, but like many experts point out, a portable AC doesn’t generally move a whole lot once it’s set up, so mobility is less of a factor than you may think. However, because the HPC12XCR is lighter than almost every model we analyzed, it does make it easy to move the unit seasonally or from room to room as needed. A permanent slide-out mesh filter is easy to clean and maintain and does a good job of keeping the air feeling clean and circulated. A dehumidification mode helps keep moisture in the air to a minimum, but it’s also worth pointing out that dehumidification is standard across the board and doesn’t necessarily need to be a leading factor in the buying decision. Say the editors over at The Sweet Home. In general, the Haier HPC12XCR receives good feedback, especially considering the average reviews for most portable ACs. Common complaints about this model are that it doesn’t cool the air quickly enough, or doesn’t offer good air circulation. However, most users note that the cooling performance is about what they expected or better, and if you have realistic expectations about what a room air conditioner can do, you may be more satisfied with your purchase. Users find it easy to set up and install, and many claims that the noise – especially compared to larger units – is manageable. Overall, the performance of the unit will depend on the size of your room, the starting and target temperatures, as well as other environmental factors. The Haier HPC12XCR comes with a 1-year warranty on parts and labor, and you can learn more by visiting Haier or reading the Haier HPC12XCR manual here. Cooling Area Up to 400 sq.ft. The above picks are based primarily on size: they are some of the best performing units that keep size to a minimum. However, if you’re willing to go with a unit that’s a little taller and heavier – though not much – you can get a top-of-the-line unit in the Whynter ARC-122DHP. This model is The Sweet Home’s recommended unit of choice and routinely receives positive reviews from users and experts alike. Its 12,000 BTUs is enough to cool up to 450 square feet, and because it’s a double-hose unit it offers better energy efficiency and less cooling waste. Its EER of 12 is higher than most portable room air conditioners, and the watts used is excellent for a unit of this size. The noise, price, and installation kit are all typical for the category. As a bonus, it can also function as a heater, and it has a drain pump so you can empty the condensation reservoir against gravity. The ARC-122DHP is also a great year-round option because of its heating capabilities: it offers 11,000 BTU heating power, just slightly less than its cooling strength. The size of the unit is on the smaller side for what you get – it’s shorter than the average unit we analyzed, though its weight (63 pounds) is on the heavier side. Still, the performance you’ll get with the ARC-122DHP is hard to match; it has an auto-evaporative system that shuts down the compressor when its tank is full, but you can also choose to hook up a hose to keep the water continually drained. A washable carbon filter keeps the room’s air cleaned and three fan speeds help with circulation. Much of the unit is average or better and put together, the ARC-122DHP is one of the more promising units on the market. Digital controls, timers, and other standard features make the unit easy to use and setup, and it comes with the advice of doing your best to seal up your room and window to make cooling more efficient. With two hoses, the ARC-122DHP has an easier time cooling down a room faster; instead of the heat from its processes and components staying in the room, this air is vented outside, which makes it slightly more effective in quickly cooling air. The ARC-122DHP comes with a one-year manufacturer warranty and a three-year warranty on the compressor, one of the better warranties available for room ACs. Overall, it’s one of the top-selling AC units for a reason: Whynter’s technology, styling, and performance are hard to beat, and this is one of their signature products. Cooling Area Up to 700 sq.ft. This is one of Friedrich’s largest units, and it’s our recommendation for people who need to cool apartments or condos. It’s rated for one of the largest range in our recommendations and has the added bonus of the heating function. The Friedrich PH14B is a superb choice for larger spaces such as living rooms. We love its sheer power, which cools air more quickly and quietly than either of the other units! Plus, it has the same excellent reputation for reliability and build quality as the smaller Friedrich. It’s more powerful than either of our other recommendations. With 13,500 BTU of A/C power, it’s rated to cool 700 square feet and do so even more effectively than the other Friedrich. It’s self-evaporating and uses the same recycled condensation feature as its smaller sibling. Previous buyers in humid areas said they were prepared to install an additional drain line to assist the unit, as they had with models they’d used previously. However, the Friedrich surprised them by getting rid of all the condensation by itself! That’s where that extra power really comes in handy! It’s a dual-hose air conditioner, just like its smaller sibling. That means it’s the most efficient of the portable options. It has all the same functions as the other Friedrich, with A/C, dehumidifier and fan feature all onboard. Like both the EdgeStar and smaller Friedrich models, there’s a 24-hour smart timer, 3 fan speeds, and automatic restart. It also comes with remote control. The major plus here is that this model adds a powerful heater function, which means that this one will work for you all year long! It’s nearly as powerful as a heater, with 10,700 BTU of heating power. Previous buyers said it’s very effective and could compensate for central air systems in apartments, as well as space heaters! As with the other two models, this one comes with everything you need to get it set up, including hoses, and a window bracket that’ll work in both horizontal and vertical windows. Even though it’s big and powerful, purchasers still thought it was quieter than some other units they had used. Overall, many previous buyers said that they were glad they spent the extra money to get a unit that really worked well. They cited the condensation system, energy efficiency, and evenness of the cooling as winning features over cheaper models they had owned. It’s covered by a 5-year warranty and comes recommended by consumers reports – they tested for cooling speed in relation to size. This unit weighs almost 100 pounds, so you won’t want to be moving it about too frequently. Some previous buyers mentioned that the air hoses and window plate aren’t built as well as the main unit. Some previous buyers said that their units arrived poorly packaged. If you get a cracked part, you might have problems with leakage. Thankfully, that’s an issue that would be covered by the vendor. If you need a large capacity cooling AC then you will need to go for a bigger sized option. This Freidrich model is powerful yet still somewhat compact when compared with other brands. We recommended the Haier HPC12XCR because of its compact size and relative performance, but there’s a clear need for larger units to cool down large bedrooms, offices and other living spaces that simply need more than 12,000 BTUs. In that case, the smallest 14,000 BTU unit we came across in our research is the Honeywell MM14CCS. At 34.02” tall, it’s the shortest of the 14k BTU air conditioners we reviewed, but still offers solid performance and user reviews. It’s one of the better-rated units on Amazon, and reviews on Honeywell’s website are also stellar, though most manufacturer websites have better, more positive ratings than third-party marketplaces. At nearly 74 pounds, the MM14CCS isn’t incredibly easy to move around, but if you’re focused on cooling power more than mobility, you’ll be fine with the weight increase. Its dimensions (15.79” x 19.92”) are also on the large side, so expect to dedicate a little more floor space to this AC. However, with that size and weight, it’s still the largest good-performing 14,000 BTU unit on the market, with Whynter’s units being fairly larger, though they do receive good reviews in their own right. The MM14CCS comes with portable AC standards like a remote, LCD display, 24-hour timer, dehumidification, and multiple cooling speeds. It doesn’t offer anything too unique, but it has good styling and most importantly, the higher BTUs to keep a larger room cooled. Honeywell says it cools rooms up to 550 square feet, but again this depends on outside factors. Window installation is easy with Honeywell’s vent kit; it’s nothing to write home about, but it will also get the job done. Settings on this unit range from 61 to 89 degrees Fahrenheit, so you have a good range of temperatures to work with. The noise on this unit isn’t much louder than our other recommended, smaller units (54 dBA), so if size isn’t an issue for you, the noise shouldn’t be either. Like all the units we recommend, it has an auto-evaporating system that doesn’t require draining, but if you use it solely for dehumidification, it does require you to hook up a standard garden hose. The MM14CCS dehumidifies 90 pints in a 24-hour day, but as we mentioned, this feature of room air conditioners should be less of consideration that overall cooling performance, as humidity will be sucked from the air no matter what. The Honeywell MM14CCS comes with a 5-year limited warranty: one year to cover parts and labor, and for years for the compressor. At 1,200 watts, the energy use is about on part with the LG 10,000 BTU unit we recommend. Overall, it’s a great option if you’re looking for the increased cooling power of a 14,000 BTU unit but still want to keep your unit on the smaller side. What about a Swamp Cooler? Swamp coolers combine a cooling foil system with a misting function to treat hot, dry air in offices or desert-like environments. They’re great for people who live in areas with relatively low humidity, who don’t want a full air-conditioner. We like swamp coolers because they’re cheap to run, don’t require windows, and only need water to operate. Cooling Area Up to 250 sq.ft. This ultra-compact unit combines a small air cooler with a humidifier. It’s designed to help people in hot, dry places have refreshing, healthier air. Evaporative coolers function by passing water through a 3D cooling pad. They then use a cool the hot air by passing it over a water-soaked pad. This process is all-natural and doesn’t use any products such as freon or other chemicals. Therefore you achieve affordable, comfortable control of your climate with a reduced carbon footprint. The Luna Comfort is our top choice in swamp coolers. It works by circulating water and air through a cooling foil, which creates a cool, moist breeze. All you need is water. The company also suggests using an ice pack in the water compartment. It comes with two ice packs, so you can keep one in the freezer while the other one is in use. It’s rated to cool up to 250 square feet. The manufacturer says that in optimal conditions, it can cool air by up to 20 degrees! Previous buyers had pretty good success with it but did warn others to be realistic with their expectations. It’ll be less effective in humid conditions, and at extreme levels of heat (90+). There’s a built-in air filter. It’ll trap dust and debris, helping you breathe easier. The filter is also washable, so you don’t have to buy replacements. Several different setting helps you control the speed of the fan and the pattern of the flow. This allows you to create “breezes” inside your house or office. It’s more environmentally-friendly than typical air conditioners. Since it’s not a traditional air conditioner, you won’t have coils full of harmful chemicals around. It’s also a cost-effective solution. While most air conditioners (especially portable units) can really eat up your electricity, the evaporative system in this model uses a lot less energy overall. The water tank pulls out for refills and holds a full 2 gallons at a time. Previous buyers said it’s very quiet. The major negative aspect of this product is that it is not a full air conditioner. You really can’t expect this to cool a whole apartment. It’s only going to work in a single room. 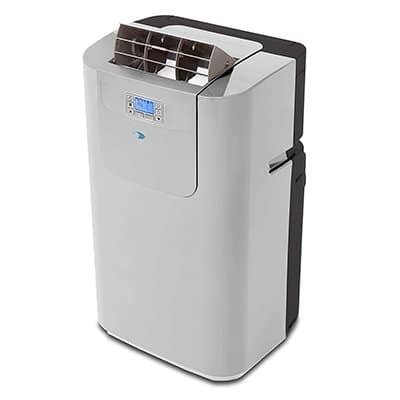 We found that a lot of the negative reviews on this model were from people who didn’t understand the limitations of evaporative coolers compared to air conditioners. It doesn’t work well in humid environments. You probably won’t want to get this if your average humidity level is over 40%. Previous buyers had pretty mixed experiences with durability. Some people said their coolers developed leaks after a year or so of use. Swamp coolers are excellent choices for certain situations and we believe this pick is best of the bunch. If you’ve decided to find the smallest effective unit for your home, here are six considerations that will help you find your ideal air conditioner. In our research, we found that most portable AC units are in the same general size range, with heights ranging from 25 inches to 35 inches, and depths and widths ranging from 12 inches to 18 inches. The weight range for units ranged from 45 to 95 pounds. On these factors, we’ve researched, compared and rated units based on height, weight, but also a combination of dimensions in general based on user experience. For example, the shortest overall unit might not be the best simply because it’s short: instead, we looked to find the best combination of compact size and cooling effectiveness. 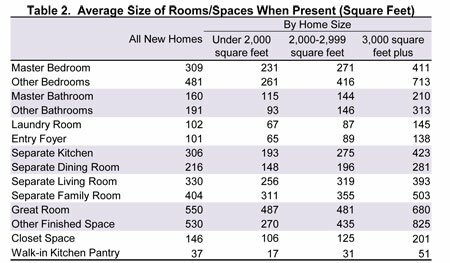 If you live in a condo, flat, apartment or other small living space, having something that takes minimal floor space is ideal, while those living in larger homes may find that weight or height are more important considerations. Remember, though: these units typically end up in one spot, so although portability may seem important, the reality is that once you find a spot by a window and electrical outlet, they may not be moved much. The cooling power of portable ACs is measured in BTUs, or british thermal units. In simple terms, a BTU is the amount of energy needed to increase the temperature of one pound of water by one degree Fahrenheit. For air conditioners, this is measured as the amount of energy needed to remove heat from the air. In theory, a higher BTU rating removes heat from the air at a higher rate, which means rooms cool down faster. In reality, the BTUs listed by manufacturers is not always accurate. A study by the Department of Energy found that many models tested showed lower BTUs than advertised. Most models had an actual BTU rating that was between 8 and 20 percent lower than expected, though one model did outperform its 10,000 BTU rating. Still, cooling down a room at a reduced BTU level can create a better level of personal comfort, so this is just something to expect with all units and doesn’t necessarily reflect one specific model or brand. So how many BTUs do you need to cool your home? Those other factors can make a massive difference in the cooling capacity you’ll need. In fact, direct sunlight alone can increase a room’s temperature by several degrees, which means you could need far more than 20 BTUs per square foot as suggested. ENERGY STAR created a helpful table to decide how many BTUs you need for your rooms. If you don’t know the exact space of your room, use a tape measure to get a rough estimate of the room’s length and width, and multiply those numbers to get the square footage. If your room has unique angles and spaces, break down each large area into sections – squares or rectangles – that are easier to measure by themselves. Then, add all the square footage totals together to get an estimate of the room’s size. While it may be tempting to get something with more BTUs even for a smaller room, remember that matching your room size and cooling performance leads to better efficiency and performance. “The most energy efficient air conditioner is sized to the square footage of the space to be cooled,” says ENERGY STAR. At the end of the day, factoring in the size of your room, environmental elements like direct sunlight, humidity and region, and how efficient you’d like your unit to run should all play a role in which model you go with. The good news: smaller AC units are often more efficient because they use less energy to cool the surrounding air. For most users, a portable AC is lugged out for summers or even just a few days or weeks during a heatwave, so the long-term energy cost of a unit isn’t significant. Still, buying an energy efficient model will help cool your room at a more efficient rate, and it’ll help keep your utility expenses down during the summer. Efficiency is measured by a unit’s EER, or energy efficiency ratio. This ratio is cooling power, or BTUs, compared to the number of watts required to run the unit. An EER rating of 10 is twice as efficient as a unit with a rating of 5, so a higher rating means better energy efficiency. Portable AC units with ENERGY STAR labels are more efficient, as they’ve met additional energy standards set by the government. Each model offers information on EER, watts used and BTUs, so you’ll have a good idea of how efficient one model is compared to others. Central air conditioning units are large and loud, but they’re also outside of the home. With portable ACs, the unit – including its parts and processes – are all inside the home that its attempting to cool down. That said, dealing with the noise from a portable air conditioner simply comes with the territory. You can find models that are significantly quieter than others, and the good news is that these are often the smaller units. However, if you are a light sleeper or easily distracted by white noise, this is something to consider before buying a unit. The range for most units falls between 50 and 80 dB, and each manufacturer should provide information on a model’s volume. Like BTUs, however, the real-world noise output of a portable AC is often different than advertised. For most users, the noise from a portable AC isn’t a huge deal, but it is worth mentioning as a consideration to keep in mind. Noise level may play a role in which rooms the unit is used: light sleepers may avoid keeping it in a master bedroom, but find the white noise ideal for a home office or nursery where it blends into the background during the day. Each of the models we’ve compared got the job done, but some offer extra features and uses that you may want to be aware of. Units with remote controls are convenient, as are units that also double as a heater, which means you don’t have to store it away during the winter. Some models, such as LG’s LP0817WSR, have features that improve air circulation and ventilation. This particular model has an auto-swing vent that moves up and down to reduce hot spots and warm pockets in a room. Models may have self-evaporating features that don’t require you to empty out the water tank, and others may have functions to keep the unit from overdelivering cool air once the target temperature is reached. Comparing a few of your top selections can help you decide which extra features would be useful, and which would be unnecessary. If you live in a home that has a good heating system, for example, you may not need an AC that also doubles as a heater. Many portable ACs come from large manufacturers that offer plenty of support and customer service options. In our research, we found that most models have a warranty between one and five years. Some of those offer full coverage, while others offer limited warranties to cover specific parts and problems. Most units are designed to last five to ten years, but as technology improves, older models may be less energy efficient. If you have an old portable AC and are looking to upgrade, ENERGY STAR makes it easy to see about how much you could save each year, though this depends on a lot of other factors. The cost of savings may seem insignificant, but the improved efficiency to quickly cool down your room may be more of an incentive to upgrade an older model. Looking for more air conditioner options? Check out our picks for the quietest window ACs and the quietest portable AC units. Portable ACs or PACs are the best cooling solution for spaces that are too small and narrow to accommodate a window-mounted version. Some common places in the house where these machines are used are workshops, sunrooms, garages, and other rooms that can be negatively affected without proper ventilation and circulation. 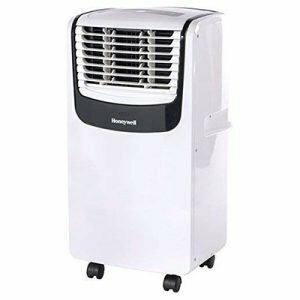 If you are planning to get one, you should make it a point to find the best portable air conditioner for your needs. There are several factors that you should consider when doing this, and it can all get a bit technical for the average Joe to understand. Don’t worry–we’ve put together a quick guide. If your machine is underpowered, you won’t see the cooling effect that you were expecting, especially in hot, humid summers. If your unit is overpowered, you might have trouble finding a comfortable setting. The first thing to do is to establish the square footage of the space you’re trying to cool down. 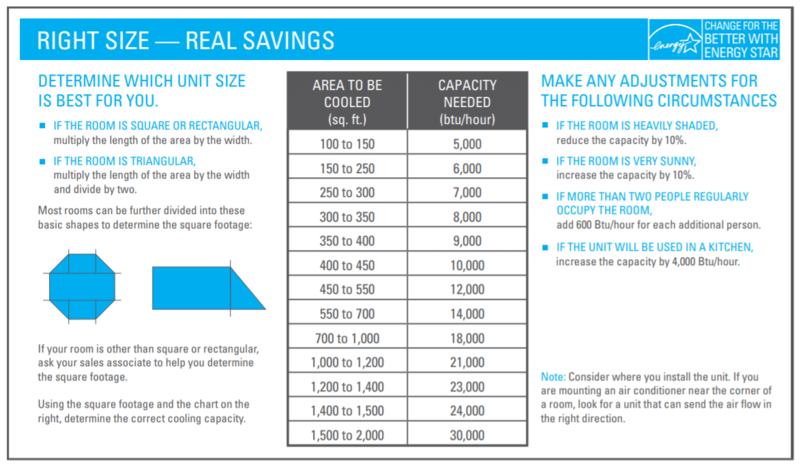 Remember that if you’re cooling a room that’s connected to another room, you should consider both of them when you’re totaling up the measurements. We’ve put together a chart of rough floor space to BTU ratios at the top of this page. Experts also recommend that you consider the insulation and floor plan of the room where you want the unit installed in order for you to determine the proper BTU or British Thermal Unit rating that you need. If you don’t take insulation and other dynamics like air flow or ventilation, there is always the chance that you will end up with excess condensation in your room. Know how high the ceilings are compared to the standard 8 ft. height, and be sure to take any big discrepancies into account. If your ceilings are higher than average, you’ll want to round up your space/BTU requirements proportionally. For lower ceilings, simply do the reverse. One other big consideration when you’re thinking about the appropriate BTU rating for your space is whether the unit in question is a single or dual hose portable air conditioner. If you’re looking at a single-hose unit, you’ll want to make some modifications to our chart. That’s because most of those ratings are tested to apply only to wall units, which have two ports for cycling air. Smaller portable A/C units like the EdgeStar are often “single-hose” designs. That allows them to be smaller an more convenient to set up in your window. However, it does make them more inefficient. If you’re looking at a single-hose unit, you’ll want to add another 50% to the recommended power rating, to compensate for the lack of efficiency. Finally, BTU guidelines can sometimes vary depending on the manufacturer of the AC unit, so you’ll want to take them with a grain of salt. We’ve used mean ratings in our chart, to help you get a rough sense of the market as a whole. Always round on the conservative side. That means it’s better to have a slightly overpowered unit than a slightly underpowered unit. If your unit is slightly too powerful, it’ll simply have less work to do. If it’s slightly underpowered, it could burn itself out early by trying to keep up with the load. Don’t take that too far, though, since a really overpowered unit might cool your space too severely. Again, when you’re doing so, make sure you always round up and err on the side of a bit too much power. You might not need every single BTU every day, but that extra power can really come in handy during a heatwave or a humid streak. First, think about sunlight, especially during the middle of the day. For example, if your room is heavily shaded, it is suggested that you reduce your BTU capacity by 10%. If the room is on a part of the house that always receives sunlight, however, then you have to increase it by 10%. The number of people that will occupy the room is another consideration. You have to add 600 BTU for each additional person beyond two who will occupy the room. That’s due to body heat, as well as the CO2 each person breathes out, which warms the room even more. Finally, make sure you think about air flow in your house. If you’re cooling a room that’s shut off most of the time, you can get away with a lower power rating. However, if there’s a fair amount of air circulating between the cooled room and the next space, you probably want more power. The controls that you prefer are the next factor that you have to consider. You can choose to have PACs which can be controlled by louvers and remote controls. Then there are also units with a manual control type which are easier to operate. Many newer units also have smart features to save you energy, and make the whole process more convenient. We like models that automatically restart the cooling process at your preferred settings after a power outage. 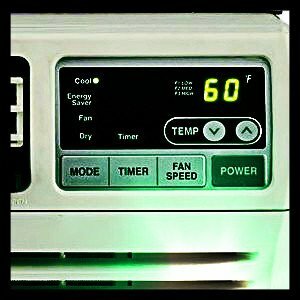 Another great feature is a timer, so you can tell the machine when specifically you need to cool the room down, and when it can shut off and save you electricity. The more you pay for your unit, the more you’ll get in terms of convenience and automatic controls. To decide on your budget, think about how often you’ll want to adjust the machine, and how many different temperature settings you’ll assign. For instance, most of us won’t run the a/c quite so much while we’re not at home, so you’ll have one temp for the hours you’re home, and another for the hours you’re at work. On the other hand, if you have pets to think about, you may simply want to pick one temperature and leave it. In addition to all the other factors mentioned, it’s important to think about the long term. Consider the amount of time you are planning to keep the air conditioner on and the quality of the customer service that the manufacturer provides. If you’re going to run it most of the year, in a warmer spot, you don’t want to skimp on durability or reliability. If you’re only going to need your unit for a couple of killer weeks in the summer, you don’t need to worry too much about finding the most rugged machine on the market. Noise levels are also very important. If you are planning to install the air conditioner in your work area or bedroom, you have to gauge to the amount of noise it produces. Otherwise, you might find yourself stuck with a unit that is too noisy. Think about where your machine will be set up, and where you’ll be while it’s running. Pro tip: Look for models with several fan settings, so you can find the right balance between power and noise! Hoses draw air in from one vent and then exhaust it through another part of a machine. However, there are slight differences between single and dual hoses. The single hose takes cool air from the room and uses it to cool down the compressor before releasing it. Not only does this waste already-cooled air, but also creates a “negative pressure” in the room. The biggest drawback of a single hose is that once the air is released through the exhaust, the warm air from nearby rooms tends to seep in, decreasing the overall efficiency. Thus, the AC must operate continuously to keep the room cool. In the dual hose case, one hose attracts fresh air from outside to cool it down whereas the other repels warm air from the air conditioner. A lot of rooms may require air conditioners due to improper air circulation, poor ventilation, or harsh climates. 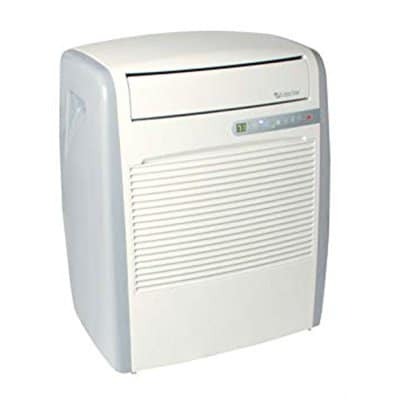 As an efficient substitute of the traditional window AC, portable air conditioners are preferred in offices due to their efficiency, cost effectiveness, portability, low noise levels, and variety to choose from. A hot day in the sun can affect you and the space you live in. A small portable air conditioner is a user-friendly appliance specially designed for your bedroom, garage, or server room where warm air can seep in. A few things you should look at before making your final decision are the warranty on the AC and its parts, reviews online, the efficiency of the manufacturer’s customer support service, and the filter’s location and condition. To fully enjoy the luxurious feel of an AC, opt for one that includes a remote control or an app that allows you to control the temperature without having to move. Do all portable air conditioners have to be vented out of a window? Just like all other air conditioning units, portable air conditioners need to have a vent to release heat. A window usually serves as the most convenient way for portable air conditioning to release heat, but other methods can be employed as well. For example, the exhaust tube can be attached to an air vent, or a small vent that leads outside could be installed. Are there ventless portable ACs? A vent-less portable air conditioner is known as a swamp cooler or an evaporative air conditioner. Strictly speaking, it’s not an air conditioner, since air conditioning — in which the air is treated, chilled, dehumidified and filtered — needs external ventilation. What is the smallest portable air conditioner on our list? The smallest portable AC on the list is the EdgeStar AP8000W based on its height of 24.75 inches. This mini AC is more than 1 inch shorter than the BLACK&DECKER BPACT08W and 2-3 inches shorter than other brands on our list. What is the lightest AC on our list? Luna Comfort clocks in a meager 16.2 lbs., making it the lightest but it is more of a swamp cooler than AC unit. For portable AC’s the Honeywell MO08CESWK is the lightest brand on the market with a total weight of 43 pounds. We found with extras attached it went up to around 45 lbs in total but this is still well below the next heaviest at 53 lbs. What is the thinnest ‘slim’ AC we’ve reviewed? 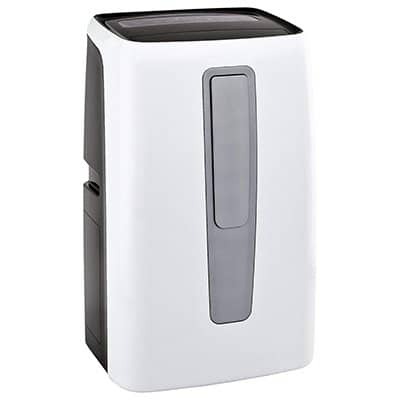 With a width that measures only 11.5 inches, BLACK + DECKER BPACT08WT is one of the smallest portable air conditioners available on the market, and this list. Its slim and compact design make it perfect for hiding your AC from plain sight. Where is a good place to buy discounted portable air conditioning units? Amazon and Home Depot are great, reliable retailers and their efforts are further bolstered by the amazing customer feedback they receive, which plays a major role in leading customers all the way through the marketing funnel. There are a variety of products available on these e-commerce platforms, for all consumers. After comparing the top portable air conditioners and reviewing the frequently asked questions and comments section, it is safe to say that Haier HPC12XCR poses as the best among the reviewed choices due to its combination of size and performance. It is user-friendly and easy to set up and install; while its noise levels have been described as non-intrusive. While the unit itself is more than proficient, it is important to remember that the performance of the unit will depend on the size of your room, as well as the prevailing climate. If you do have a smaller size room, such as a bedroom then the Honeywell MO08CESWK is a smarter choice.